Kelly O’Donnell ’19 has had two unusual international experiences while at Chatham, singlehandedly started the cheerleading squad, and is the Resident Assistant for the Women’s Living and Learning Community—but she’s not done with discoveries yet. “I have fallen in love with ceramics!” she announces, in the course of talking about her interdisciplinary major of marketing and the visual arts. “Head over heels. I’m in the studio all the time.” O’Donnell says that the first ceramics class was in the spring, and she’s taking another one now, this first semester of her last year at Chatham. It’s a good reminder that new passions could be right around the corner for any of us. And that older ones needn’t be left behind—take cheerleading. O’Donnell has cheered since she was 12, and her sister coached her in high school. “When I came to Chatham, I thought I was going to do swimming,” she says. “But I just missed cheerleading so much.” So O’Donnell went up to Vice President of Student Affairs and Dean of Students Zauyah Waite at a “Dinner with the Deans” event and told her that we should start a cheerleading squad. “If you can get interest in it, we’d love to do it,” Dean Waite told O’Donnell. As you’d expect from someone who brought in her sister to coach her cheerleading squad, O’Donnell is close to her family. But she was eager to “get away” and study abroad, and was awarded a Vira Heinz scholarship to help make that happen. Shortly after O’Donnell returned to Chatham, she attended a study abroad returnee conference at Carnegie Mellon University, “and I just thought, ‘I have to go abroad again!’ she laughs. 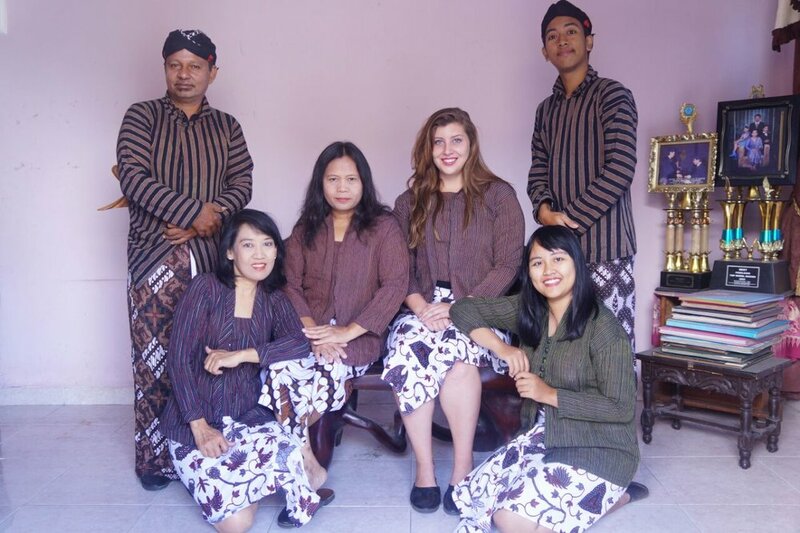 Chatham Study Abroad Coordinator Karin Chipman gave O’Donnell a flyer advertising the United States Indonesian Society (USINDO) Summer Studies fellowship that’s designed to spread awareness of Indonesia to Americans and back again. O’Donnell applied, didn’t hear back, and didn’t think much of it. “Then one day I was sitting in Anderson having lunch with my friends, and got an email that said ‘Kelly, are you still interested? We’d really like to have you’—the acceptance email had gone to my junk mail! I had a week to decide whether I was going to Indonesia!” she says. The program was amazing, says O’Donnell. It was located in Yogyakarta (pronounced ‘Jogjakarta’), considered to be the cultural center of the island of Java. 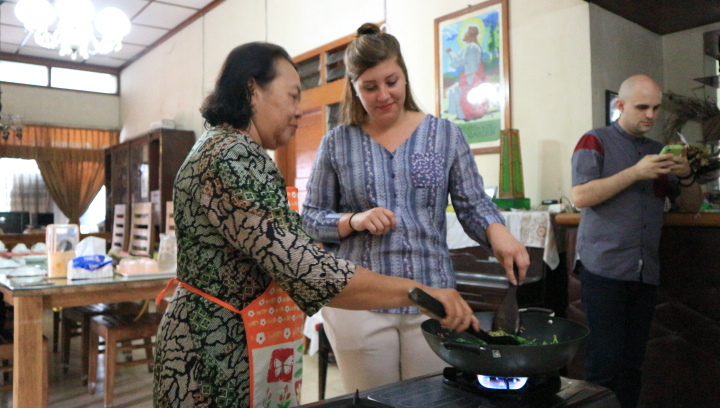 There was an intensive language component, and participants got to choose a cultural class to participate in, like martial arts, traditional dance, gamelan (traditional Indonesian music), batik, or cooking. O’Donnell chose cooking. On the first day of participants’ internships, many had an orientation and were dismissed by 12 noon. But O’Donnell and a friend who was also interning at the palace were invited to return that night and help livestream the royal family as they broke fast for Ramadan. “Yes, we would like to come break fast with the royal courts! Yes, absolutely we would like to do that!” she laughs.